Now that the independent company's got rid of those pesky excess components, it's time for VAIO to make something new. And it's not a smartphone. Yet. The PC maker has announced two new PCs here in Tokyo: the VAIO Z and VAIO Z Canvas. The latter is actually eventual final version of the prototype tablet that did the rounds last year -- but we'll get to that. First, inside the flagship 13.3-inch VAIO Z which goes up for preorder in Japan later today, you'll find a second -generation high-speed SSD and an unspecified fifth-generation Core i7 processor, all bound up in aluminum-carbon shell. However, bare specs aside, the company reckons its a lot of the little details that matter, and we'll get to those right after the break. It's been three years since we've seen the flagship Z series, and VAIO's attempted to bring its namesake right up to date: there's a 'multiflip' mode that allows users to switch between a tablet slate, ole-fashioned laptop, as well as a viewing mode where the screen faces away from the laptop. During the lengthy presentation, the execs were keen to stress that this 'Z' also stood for zero -- this is VAIO's new start. Because of the aluminum-carbon construction, the Z weighs 1.34kg and measures in at 16.8mm thick. (Yep, the Lenovo LaVie HZ550 laptop that wowed us at CES is lighter, but it doesn't do so much hardware acrobatics, either.) VAIO is promising it'll eke out 15.5 hours of use, which would make it the longest lasting laptop it's ever made. That's ever. To accomplish this, VAIO's engineers recomposed the battery inside the Z, shedding several layers inside the cell to improve capacity without impinging on weight or size. There's also a special power-saving display mode, where the screen projects its light in a narrower angle, which can apparently drop power consumption down by an incredible 40 percent when compared to typical LCD. The company even claims that its keyboard sounds less annoying, and its built a keyboard that makes substantially less noise -- once we've hammered away at one outside of a noisy demo floor, we'll let you know how that exclamation stands up. The return of VAIO's flagship won't come cheap: it'll retail for around 190,000 yen in Japan, which is a nudge over $1,600. During the lengthy presentation, the execs were keen to stress that this 'Z' stood for zero -- this is VAIO's new start. 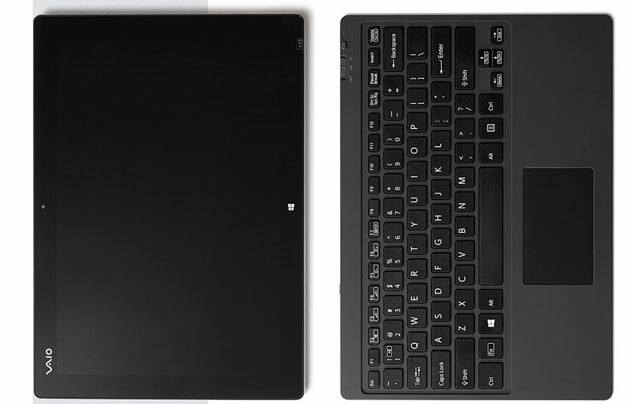 The VAIO Z Canvas (coming later in May) doesn't transform quite as much, but the keyboard detaches from the 12.1-inch display, which is certainly creative work friendly, at 2,560 x 1,704 resolution and color reproduction covers 95 percent the Adobe RGB color gamut. It's pitched less as typical workhouse Ultrabook, and more for the creatives among us -- we know you're out there. Naturally, there's a (unspecified) digitizer stylus alongside the device itself. Details were notably sparse, but then, there's still three months to go. VAIO does promise that it'll be able to cram up to 1TB of storage inside the Z Canvas.